‘The Swilly’, or to give it its proper title ‘The Londonderry & Lough Swilly Railway Company’ (which last ran trains in 1954), has run road vehicles since 1929 in the spectacular and sometimes remote County Donegal, North West Ireland. Predominantly a Leyland operator, an urgent need for vehicles in 2003 led to a total of 28 former Ulsterbus and Citybus Bristol RELLs with Gardner engines and Alexander (Belfast) bodywork joining the fleet. Used virtually exclusively on schools services and in many cases outstationed at drivers’ homes, they often proved elusive to enthusiasts but our cameras tracked down the majority of them at work between 2004 and 2007. When the last one (451) was withdrawn, by then having reached the prescribed age limit for School Buses, these REs had outlived those in use with Ulsterbus and Citybus by over three years. The Bristols proved popular vehicles during their time with the Swilly, some of them remaining in Belfast colours whilst others carried yellow and white livery. Six were repainted in the Clydeside Scottish inspired red, white and yellow scheme carried by many of the Leyland Leopards they replaced. Their rasping exhausts combine with the typical Bristol gearbox noise to provide distinctive aural effects, whilst there are a number of highly scenic locations seen in both sunshine and rain! Only in 2009 did the last operational examples leave the Swilly depot in Derry, being two of a number to last into preservation, and their departure also features on this DVD. 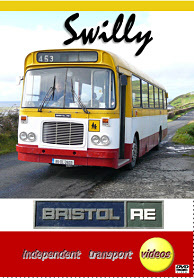 So sit back an enjoy Ireland’s last Bristols in everyday service! Duration : 73 minutes (approx).